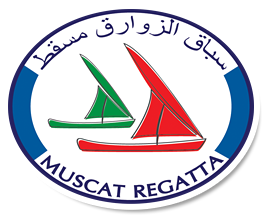 Muscat Regatta - Inshore Dinghy Racing. The inshore dinghy regatta will be held at Marina Bandar Al Rowdha January 17th and18th 2014 - We look forward to seeing you there! The 230 Mile Muscat to Khasab Bank of Beirut Chairman’s cup yacht race, started from Marina Bandar Al Rowdha on Sunday 10th November in perfect conditions. 7 boats including a British entry, a Kuwaiti entry, 2 UAE entries and 3 boats from Oman entered in the IRC racing boat class. 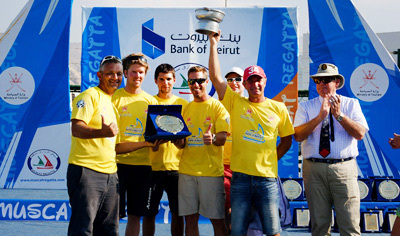 Vying for a share of the $50,000 prize fund, generously donated by The Bank of Beirut, the 2013 fleet made the most competitive race that the Muscat Regatta has seen to date. Dubai based communications company, Xtra-Link equipped the yachts with the latest satellite communications equipment for the second year running. This included Thuraya XT satellite phones and hi-tech tracking devices, which allowed race fans, all over the world, to view the race live on the regatta website. (an archive of the tracking can be found at: www.muscatregatta.com/news/2013gps/ ). As always the excellent support of the regional navies, Coastguard and Police ensured there were no security concerns, and race organisers GWM inspected all the boats prior to the race to ensure there were no safety issues. 2013 saw a classic offshore race, that for the most part was sailed in light airs. The event came to a conclusion on Tuesday 12th November, in the remote northern province of Musandam, located in the spectacular fjords in the Strait of Hormuz. After three nights at sea, all of the yachts competing in the Bank of Beirut Chairman’s Cup were accounted for in Khasab, only one boat failing to officially finish the race due to lack of wind. There was also insufficient wind for the Cookson 50 owned by Mr Adrian Lee, CEO of Lee Overlay Partners, and winner of the Dubai Muscat Race to realise its full potential. Sailed with a professional crew she took line honours and was second overall. Lee Overlay were beaten on corrected time by the lowest rated boat in the fleet, ‘Dames Jeanne’, a UAE based yacht skippered by Jean Phillipe Girard. Jean Phillipe was a previous competitor of the Bank of Beirut Chairman’s Cup, taking part in the 2012 race, in which he was unfortunately forced to retire due to adverse weather conditions. The same fate happened in this year’s Dubai to Muscat race, but it is a testament to the popularity of the Bank of Beirut Chairman’s cup that his crew continued to Muscat to enter the Muscat to Khasab event. Added interest would have been provided by the participation of ‘Blackwater’, a high performance catamaran from the United States. Unfortunately she retired from the Dubai Muscat Race due to crew issues, but will hopefully take part in next year’s Bank of Beirut race. All the sailors expressed great enthusiasm for the event and a expressed a desire to compete again next year. The owner of the Cookson 50 that was dismantled and shipped from the UK to take part, described the race as ‘A truly great event’. The sailors were unanimous in their support for the Bank of Beirut Chairman’s Cup, and showed enthusiasm to compete again next year. Jean Phillipe Girard, and the crew of Dames Jeanne vowed to be back in 2014 to defend their title. We have uploaded a selection of images from the 2013 Bank of Beirut Chairman’s Cup – Muscat to Khasab race. 2013 Notice of race – Amended! 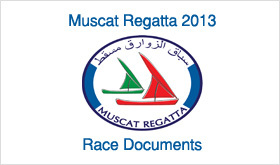 The Notice of Race for the 2013 Muscat to Khasab Bank of Beirut Chairman’s Cup has been amended and republished. The new document supersedes all previous editions. 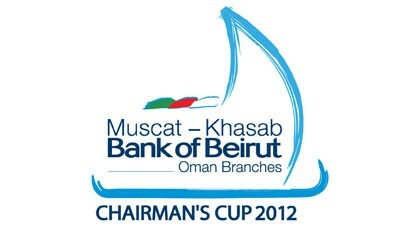 The Muscat to Khasab Bank of Beirut Chairmans’s Cup dates are now finalised. 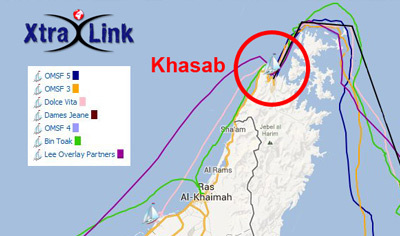 The race will start on November 10th 2013, and is expected to conclude on 14th Novmber 2013 in Khasab. Last year’s winner of the Bank of Beirut Chairman’s Cup was Calum McKie – skipper of ‘Boracic’ who picked up $20,000 for winning the 2011 race. The RORC recognised 230-mile Bank of Beirut Chairman’s Cup Race came to a dramatic conclusion on Tuesday, 27th November. A 40-knot rainsquall ripped through The Strait of Hormuz, just as the bulk of the IRC Racing fleet approached the finish line. Under pewter skies with thunder and lightening lighting up the steep mountain province of Musandam, it was an electrifying finish to the race. After three nights at sea, all of the yachts competing in the Bank of Beirut Chairman’s Cup Race are all accounted for and the feisty finale was in stark contrast to the majority of the race, where calm seas and gentle breeze had provided sublime sailing conditions for the best part of three days. 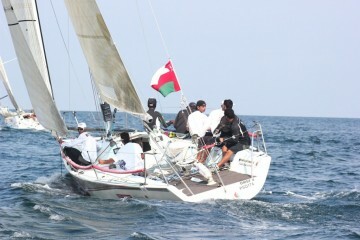 First to finish was the Royal Navy of Oman’s Farr 30, skippered by Qais Saif Al Marmari, which had chosen to sail well offshore for the majority of the race. The team made a big gain, especially on the second night, to open up a sizeable lead. 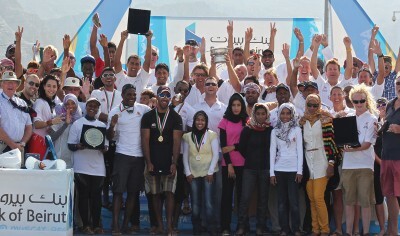 However, the Royal Navy of Oman team had failed to keep inside a virtual mark of the course and shortly after the finish gracefully retired from the race. It was a noble gesture and the team was roundly applauded for their honesty. In sharp contrast to the Royal Navy of Oman’s offshore route, Sonke Stein’s A35, Dust Devil stayed inshore in the Gulf of Oman and the tactic truly paid off, as Dust Devil took line honours and recorded the best corrected time under IRC to win The Bank of Beirut Chairman’s Cup. 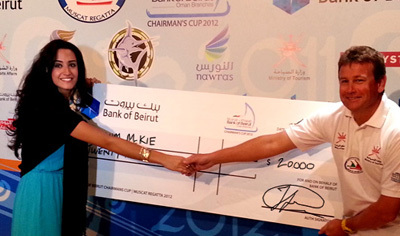 Sonke was understanderbly delighted to pick up the lion’s share of the cash prize; $22,000 generously donated by the Bank of Beirut for the first prize and line honours. Second overall after time correction was Oman Sail’s Farr 30, Renaissance. Skippered by round the world sailor, Ahmed Saif Al Marmar, the team also contained four members of last year’s team for the Tour de France à la voile and current MOD 70 Crew. All of the crew are prodigies of the Oman Sail programme and their excellent result shows the strength of sailing amongst Omani nationals. There was heartache for the Two handed team from the Dubai Offshore Sailing Club of Matt Britton and Joel Bryant racing J/92, Privateer. The team had been in contention throughout but was caught out by the brutal windstorm within sight of the finish. Short-handed, they struggled to reduce sail and were forced to bare away and run with the wind, after sailing away from the finish, Privateer lost precious minutes and the delay cost second place by just 20 minutes, in a race lasting over three days. However their smart action in difficult conditions was recognised by the award of the Seamanship Prize for the race. A record number of 13 Yachts competed in The Bank of Beirut Chairman’s Cup Racer. Race management team, GWM Racing used the RORC IRC system to award a share of the $50,000 prize fund, generously donated by The Bank of Beirut. All of the yachts that correctly sailed the course were given a $1000 share of the prize fund, which was very well received at the Prize giving. The UAE Sailing and Rowing Federation’s Dubai to Muscat Race will start Saturday 9 November 2013. The Muscat Regatta, inshore racing at Marina Bandar Al Rowdha, will start be held 14-15 November 2013. The Bank of Beirut Chairman’s Cup Race from Muscat to Khasab will start 16 November 2013. The RORC recognised 230-mile yacht race, started from Bandar Al Rowdha Marina, Muscat on Saturday 24th November and finishes in the remote northern province of Musandam, located in the spectacular fjords in the Strait of Hormuz. A record number of 13 Yachts are competing this year using the RORC IRC system, vying for a share of the $50,000 prize fund, generously donated by The Bank of Beirut. The decisive part of the race looks set to be the approach and negotiation of The Strait of Hormuz. In the 19th century, it was the location of a British repeater station used to send messages from London to Karachi. It was not an easy posting for the operators and is thought to be the origin of the term “go round the bend” with a reference to the heat making British officers desperate to return to civilization, which meant a voyage around the bend in the Strait of Hormuz. 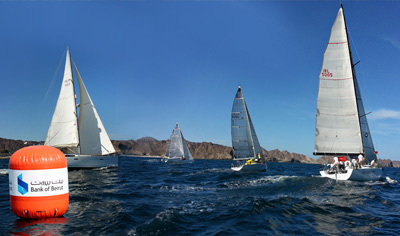 Two Rally Class yachts chose to motor to Khasab; Sarah Baerschmidt’s Omnia and Gordon Joyce’s Talitha. However, the IRC racing yachts in The Bank of Beirut Chairman’s Cup still have to ‘go round the bend’ and it looks like it might not be a straightforward task. During the second day, a light easterly breeze suited the Farr 30s, overtaking Diablo, an intense battle is building between the lighter displacement Farr 30s. However, after time correction Matt Britton’s J/92, Privateer racing Two-Handed, is very much in contention. David Worrall’s First 36.7, Shahrazad is also going well. The tactical decision, facing the teams this morning, is whether to sail the extra miles to shore in search of sea breeze or to remain offshore and use the south easterly gradient, which is expected to build to ten knots during the day, especially as the funnel effect of The Strait of Hormuz starts to kick in. Sonke Stein’s Dust Devil made a play for the inshore option early in the race and it will be interesting to see if the tactic pays off. A close battle for the $50,000 prize fund is expected to conclude today or early tomorrow. The wind is expected to pick up later today. However, weather models predict rain coming in from the northwest by midnight tonight, which could bring much heavier wind in the squalls. At daybreak tomorrow 12 – 15 Knots is expected from the northwest, which will be on the nose as the fleet come through The Strait of Hormuz, it is likely that the yachts will experience a rough last night at sea, a final twist to this fascinating race is a definite possibility. The GWM Racing Team have arrived in the remote province of Musandam, the 300 miles road-drive to Khasab included some spectacular scenery through the rugged mountains of the northern most province of Oman with its lagoons, mountains & fjords, Musandam is a spectacular setting for the finish of The Bank of Beirut Chairman’s Cup. 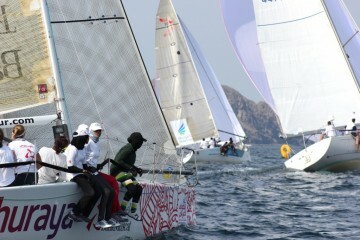 Pictures from the Start of The Muscat to Khasab Bank of Beirut Chairman’s Cup race. 24th November 2012. This is the third edition of the 230-mile race. 13 Yachts are competing under the RORC IRC system, vying for a share of the $50,000 prize fund, generously donated by The Bank of Beirut.